Doha Bank received the “Global Good Governance (3G) Awards 2017” under the category “3G Environmental Responsibility Award 2017” on 24th April 2017 at Fairmont The Palm, Dubai, UAE. This award ceremony was hosted by Cambridge IF Analytica. Leaders from Corporate Sector, Social Sector & Philanthropy sectors participated in the Award Ceremony. Doha Bank releases its 2016 Sustainability Report in accordance with Global Reporting Initiative G4 - core option. 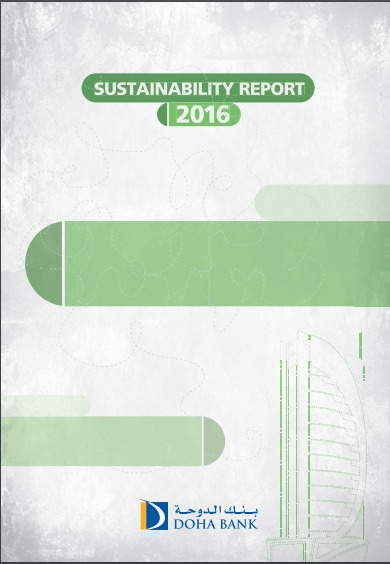 This is Doha Bank's second sustainability report developed in accordance with GRI. The report covers Doha Bank's commitment towards sustainable development, in addition, the report covers their sustainability performance throughout the year. How much data does Doha Bank have available on ArabSustainability.com?